Bend forward, sideways, or backwards –Joint dysfunction can sometimes be detected during this activity. Grip something such as a grip dynamometer – Your grip strength is vital for showing signs of muscular or nerve damage. Stand or sit – Posture can sometimes show whether you have issues in your spine. Next, a short physical exam by the chiropractor will involve palpation, or use of the hands, to explore the movement of your spine and other structures, as well as provide information on any stimuli that may cause or relieve pain. Depending on your condition, X-Rays may be taken. 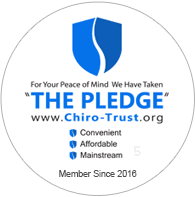 The chiropractor may also consult with you about making important lifestyle changes, such as exercise, nutrition, proper ergonomics, and smoking cessation to improve your chances of healing faster or preventing further injury.